With its 33 hectares, the Bare Cemetery is among the largest in Europe. In terms of the configuration of its terrain and landscape design, Bale Cemetery it is one of the most interesting and most beautiful eternal resting places in this part of the world. It is equipped with drainage, water supply, sewage and electricity installations. It is located in the foothill of Hum, on the east side and it was open in 1962. The central part of the Bare Cemetery comprises a staircase and a porch that connects the Catholic, Orthodox, Muslim, Jewish and atheist chapels. The cemetery was designed by architect Smiljan Klaić, while the frescoes on its porch were painted by Rizah Štetić. 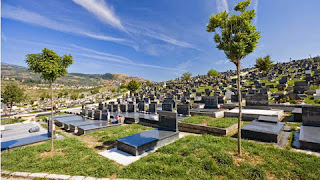 Burial areas for Muslims, Orthodox and Catholic Christian, Judaists, Evangelists, Old Catholics and atheists in the proportions that correspond to demographic structure of Sarajevo.